In the late 1800’s there were many towns, around southern Arizona that were created as a result of the short-lived silver mining boom. Most of them them were completely abandoned and are now only ruins, whose inhabitant’s are long since gone. 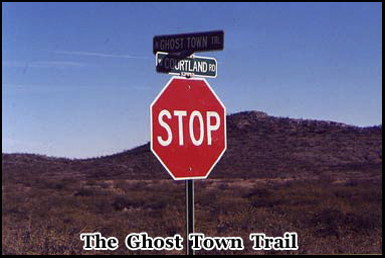 Several of Tombstones ghost towns are within a few miles of each other along a dirt road known as the ”Ghost town trail”. Only the half crumbled buildings of towns such as Courtland, Pearce and Gleeson remain. Hidden deep in the undergrowth, where schools, homes and businesses once stood, only partially standing walls, or rubble remains. 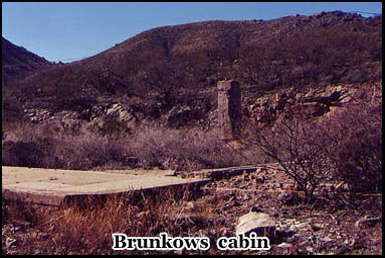 One of the most notorious of these is Brunkows cabin, known as the bloodiest cabin in Arizona. Within this mining cabin over 21 people were known to have been murdered over a period of several years. Today their ghosts appear to live on. If you decide to visit the wild-west town of Tombstone Arizona, which is best known for being the location of the gunfight at the O.K corral, make sure you leave time to visit the surrounding area. 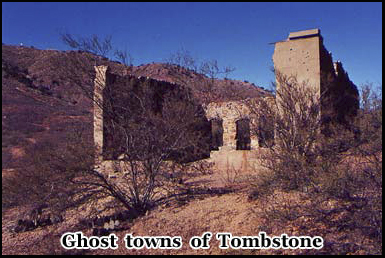 For although Tombstone was a ghost town that came back from the dead there are many nearby that didn’t. Most of Tombstones ghost towns are not sign posted, and many are difficult to find. I got much of the information about the many in Arizona, from the internet. You may also find that good sources of information are the people that work in the hotels or motels where you may be staying. The owner of the Larime motel which is where I stayed in Tombstone was very knowledgeable on the subject and drew me a map to the “Ghost town trail” and Brucknows cabin which are two major points of interest. Hidden along the Ghost town trail there are at least 5 or 6 ruins of various sizes and states of decay. I didn’t have a four wheel drive vehicle, but it’s not essential as much of where I was heading is a combination of paved road and dirt track, but has little extreme terrain. I set out from the motel about 9 am in the morning. The return drive along the Ghost town trail is about thirty miles each way if you want to cover the three main towns of Gleeson, Courtland and Pearce. Make sure you have at least half a tank of petrol before you leave Tombstone, as there is no where to fill up along the way and it is not a good place to break down. It was about ten miles to the first stop, which is Gleeson. It’s a solitary drive through Tombstones ghost towns, quiet back roads surrounded by cactus and desert, and I only passed one car during the whole journey, and that was headed in the opposite direction. I am now in the area known as the Dragoon Mountains. Unlike most of the surrounding areas the mines here produced turquoise instead of gold. This was once extracted by the Indians that lived here until miners moved in and began prospecting. mining was short lived. But in 1900 a man by the name of John Gleeson once again started to mine turquoise, and also began digging for copper. But there was no adequate water supply at the site of the original mining settlement in the hills, so the town was moved from there into the valley and became known as Gleeson. It had its own post office that opened in 1900 and eventually the population grew to 500. When I arrived I had to pull over to the side of the road to take some pictures. 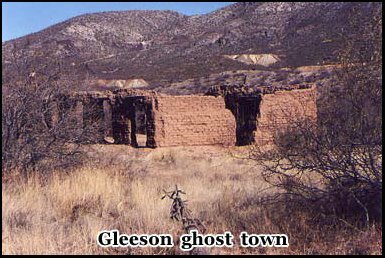 Although Gleeson is classified as a ghost town, a few people still live there. There are also several signs in front of the ruins of the remaining buildings, warning people not to trespass, as some of them are still on private land. But if you have a telephoto lens you can still get some reasonably good photographs. A few of the ruins are fairly intact and almost habitable, they are built in the Spanish adobe style, of bricks made of mud. In the far distance you can still see what is left of some of the mining equipment. In 1912 there was a fire in the town that destroyed 28 houses, the town was rebuilt but the original founder John Gleeson sold his claim in 1914. There was still copper to be mined, and the post office here remained open until 1939, but by this time most of the population had left.If you look across the road from the main buildings there are the remains of a jail. You can also see what was once a hospital, and there is an old general store that over the years has occasionally reopened. I got back in the car and started heading along the road to Courtland. This is the part of the Ghost town trail where the paved road becomes dirt. It seems like from this point on every few miles you will suddenly come across some sort of abandoned ruin hidden deep in the undergrowth. It is a very quiet desolate drive, but you have to remember at one time there were whole community’s living in the area. They were almost entirely dependent on the mining, and once the mines were no longer profitable, they virtually vanished overnight. I had a guidebook with me containing old black and white photographs of three of Tombstones ghost towns showing life as it used to be in the late 1800’s / early 1900’s. As I came across what were the remains of Courtland , I wondered what became of the people that were here before me. There was one picture I had of the “Southern Arizona Auto co”, that was now nothing more then a few bricks and crumbling foundations. The photograph was taken in 1909 and shows one of the people that once lived here driving away in an old Ford, as behind them a mechanic rolls a tire back into the forecourt. I parked on the side of the track, again there are a few no trespass signs, but out here their ignored. I would think there directed at people that wish to vandalize these places, rather then those that come to view them for their historical value. Several yards off the road to the right is another jail, it looks exactly like the one I had passed a few miles back in Gleeson. I made my way through the cactus and undergrowth to take some pictures. I should image there are a lot of rattlesnakes in the area, so I was careful to watch where I walked. Courtland like Gleeson also had a post office at one time. It opened in March 1909 and closed in 1942. The town supported a population of over 2000 people at its peak and even had two local newspapers. There was running water and electricity and even a movie theater. It is strange to think that somewhere within a few hundred yards of where I am now, in what seems to be a forgotten wasteland, people once watched the latest movie release over sixty years ago. 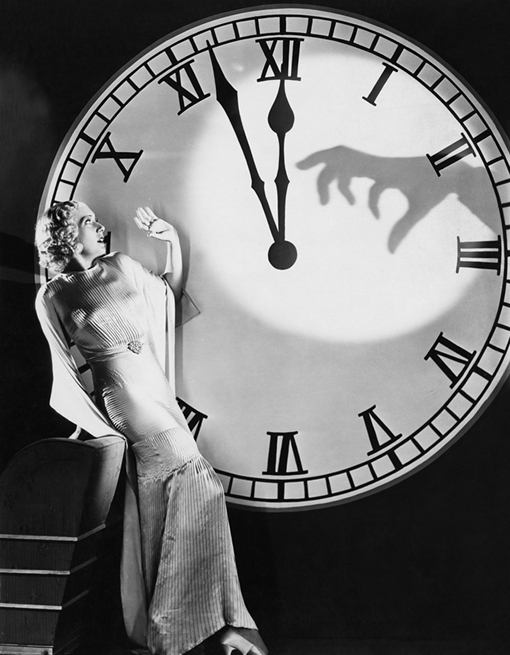 Then the theater, stores and post office closed, and the death of the town came soon afterwards. If you continue your drive on up the dirt road eventually you will come to a sign that says “Ghost town trail”, there can’t be too many signs like this in the world and is definitely worth a stop for a picture. 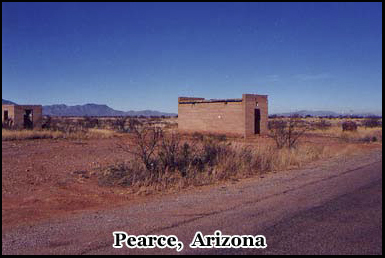 Another few miles along the road you come to a town by the name of Pearce. As I got nearer I did notice a few patrol vehicles pass me, in a reminder that you’re not that far from the Mexican border. 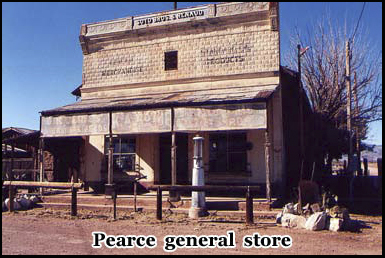 Pearce although classified as a ghost town still has a significant population. 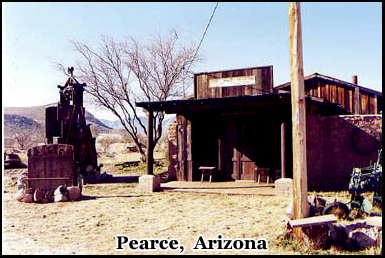 After James Pearce discovered gold in the area, he founded the town in 1894. The commonwealth mine which was responsible for its prosperity was said to have produced almost fifteen million dollars worth of gold during its lifetime. The general store has been extremely well preserved and operates even today. This was founded in 1896 along with the post office, and a railroad station opened here in 1903. A man called john Brockman eventually bought the mine and the population rose to about 1500 in 1909 it once had schools, many businesses, restaurants, and saloons. In the 1930’s during the depression the town went into decline. But there are still several ruins in the area from that time as well as a few restored or preserved houses and buildings. There is another jail in Pearce and this one is almost fully intact. I assume because they were jails they were built stronger and lasted longer, and that’s why so many remain. If you drive a few minutes down the road behind the general store there is a very interesting old cemetery. I found it to be far more authentic then the Boot hill graveyard in Tombstone, although most of the occupants in this one aren’t as famous. It is in a fantastically remote location. Behind it there is just the desert, and in the distance there are mountains, that were once filled with gold. There are still fresh flowers on some of the graves and the cemetery is obviously still in use. There were a couple of particularly interesting graves, one was of a man by the name of John Newbury who died in 1902. 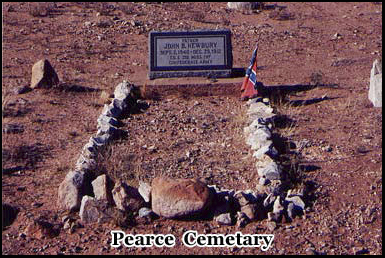 He was a confederate soldier, and next to his grave was a small confederate flag that looked like it had been placed there fairly recently. 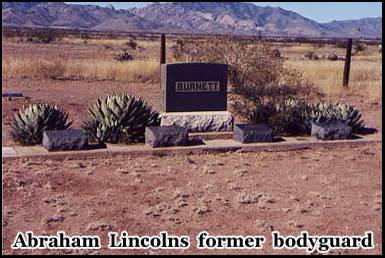 There is also a much larger quite elaborate marble tombstone with the word Burnett on it. He was actually Abraham Lincoln’s bodyguard. I spent about an hour wondering around the cemetery then headed back along the Ghost town trail. I returned to Tombstone for lunch, the best places to eat are down the side streets where you won’t find as many tourists. Later I went back to the motel; the owner is quite an authority on the locations of Tombstones ghost towns. At the time he had been exploring an area where he believed he had discovered what were the remains of the Clanton ranch. The Clanton brothers were sworn enemies of Doc Holiday and Wyatt Earp and they became famous for their participation in the gunfight at the O.K corral. There was one final place I wanted to see, again this was something I read about on the internet. It is a place called Brunckows cabin. Twenty one people were killed here, including the man who built it, Frederick Brunckow who was stabbed with his own rock drill then thrown down a mine shaft. Like several of Tombstones ghost towns this one was supposed to be haunted, and people camping nearby have reporting seeing ghostly figures there at night time. It’s only a few miles out of town. The motel owner drew me a map, and it took about fifteen minutes to get there. There is a dirt road a few yards off of the highway. At the entrance is a small plaque telling you that you are at Brunckows cabin. The area is quite overgrown, and at the time littered with broken beer bottles and the charred remains of a recently built campfire. Although it’s not that far from the main road by the time you drive down the track, it begins to feel quite isolated. There are a few foundations left of other buildings, but the one most intact is that of the cabin itself. Although it’s just the remains of the walls and the large stone slabs that once formed the floor, you can still see where the doors windows and fire place once stood. 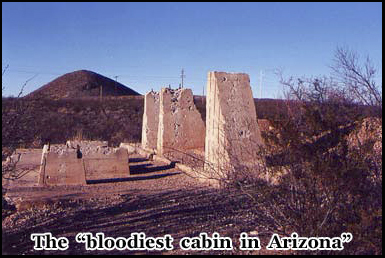 The cabin was built in 1858, and has been referred to as the “bloodiest cabin in Arizona ” due to the number of murders that took place there. The surrounding area is still full of abandoned mine shafts, where prospectors once mined for gold. You can only drive the car so far before the road narrows and you have to reverse out. I really can’t imagine many people just happen to pass by this place and visit. But I expect that a few will seek it out like I have. As I walk around the ruins, you do get the feeling that you are being watched, and there is definitely something unwelcoming about them. I only stayed for a few minutes, I don’t think I would want to spend the night camping out here. 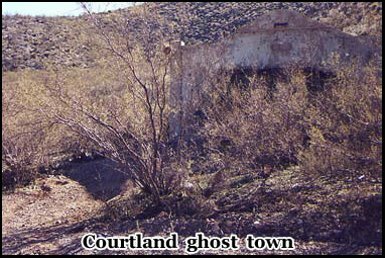 In Arizona there are literally hundreds of ghost towns, some of them are still remembered but most have been completely forgotten. Tombstones ghost towns like many seem to be a particular phenomenon of the mining industry of the late 1800’s. Large communities were created from nothing, then disappeared as quickly as the gold, leaving only empty buildings as reminders. You can’t really imagine this happening today, as the nature of industry has changed. But the ruins that do remain still continue to conjure up images, of cowboys, prospectors, and of the Wild West as it once was. Hey Buddy!, I found this information for you: "Tombstones Ghost Towns". 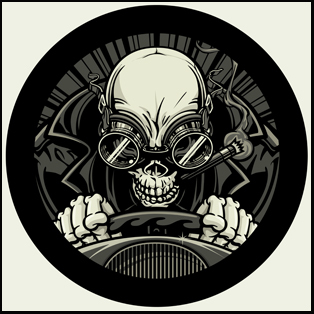 Here is the website link: https://www.chasingmidnight.com/tombstones-ghost-towns. Thank you.